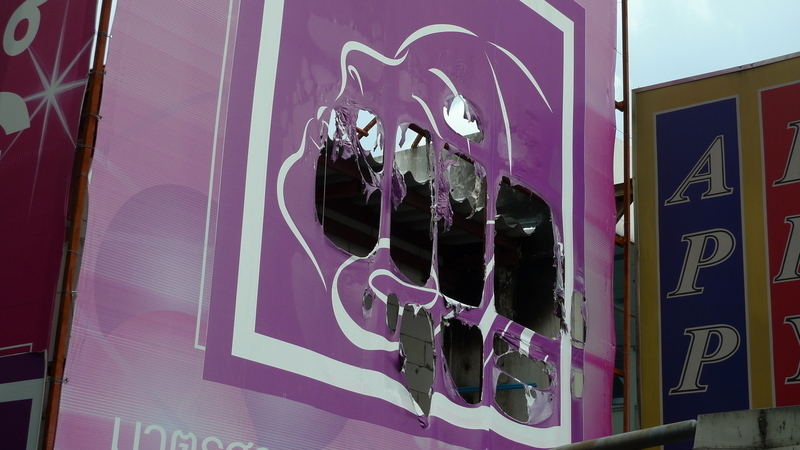 In the aftermath of the May political protests and the two days of rioting and fires that followed, certain parts of the city showed the scars of this violence, despite efforts by business and civic leaders to clean up and put on a fresh face. One area in particular where these scars still showed was the shops in the eastern section of Siam Square, a popular shopping destination in the heart of Bangkok. Until just a few weeks ago – more than two months after the protests – this sign from a skin care clinic remained unreplaced. I saw it while walking from the Siam Skytrain station and found it very evocative of the Buddhist teaching that everything is impermanent, our beauty as well as our bodies. Just a week or so ago, I passed by again and noticed that the clinic has put a new sign up and is, it seems, back in business. In this most Buddhist of countries, you can once again test the precepts of your faith and see if beauty can be made permanent. This entry was posted in Uncategorized and tagged Bangkok, Beauty, Buddhism, Damage, Fire, Krungthep, Melting, Siam, Siam Square, Sign by christao408. Bookmark the permalink. Oh, Siam station is right across from the Paragon. Goodness gracious no damage done to the big P! I like to think of beauty to be ever evolving… each age has its own take. @Dezinerdreams – As I approach my 40th birthday later this year, that’s a perspective I particularly like! @CurryPuffy – Yep, so damage there. It seems some protesters tried, but Paragon’s fire team was in place and responded very quickly. @ZenPaper – Exactly. Someone compared life to an onion where we peel of layer at a time to get to the core of self. Everything human and inanimate, is skin deep; so sad that humans with the brains, are responsible for so much destruction. @agmhkg – Ha ha – and there is plenty of it here! @Fatcat723 – With the plastic surgery, etc. you can add new layers! @murisopsis – I thought it was a striking image, especially where one melted place is where the eye belongs. @ZSA_MD – Perhaps it is because we have the brains, that we get ourselves into so much trouble. I can’t understand the mentality of those who, being angry with their government or local council, decide the best way to go is to destroy the very environment they themselves have to live in ! @Chatamanda – Well, it is a confusing situation. In this case, the protesters were (for the most part) from upcountry and so the area they set about torching was not the area they have to live in. But your point is still well-made.